My brothers returned home. This was their mistake. They were safe were they were, in Russian territory, but they came back. They missed their home, their family, our mother. Leib and Michael tried to do what they could to protect our family. When it was announced that all Jews were to hand in their weapons and other valuables, they quickly buried in our fields my mother's fur coats and my father's military pistol. This way, they said, when the war was over, at least we would have those. My mother was grateful for their help and thankful that her boys were home for the holiday. It was late September 1939 and Rosh Hashanah, the Jewish New Year, was approaching. The holiday is a time of introspection, a chance to look back at the mistakes of the past year and plan changes for the new one. A new year. The concept was difficult to conceive; even harder to plan for. German trucks and soldiers surrounded us, watched our every move. When we thought about our immediate futures, we thought of safety, security, escaping Pilzno, hiding out in Russian territory. We were not thinking of how to better our individual selves. Typically, Rosh Hashanah is spent in the synagogue. This year we wondered if that would be possible. Although the streets were quiet and we had been getting around, trying to live our normal lives, we had not been going to the synagogue. German trucks and soldiers surrounded it, watched it, dared us to go in. Moshe Ber, the temple shammus, or caretaker, assured us that everything would proceed as planned and that our holiday would be celebrated. "Yes, yes," he said confidently, "there will be services." The German troops had other plans. The day before Rosh Hashanah, two soldiers entered the store of David Chilowicz, a successful Jewish merchant. They helped themselves to whatever they wanted off the shelves, including a 50 gallon barrel of nafta. A kerosene based oil, nafta was used regularly by customers for lighting lamps. The soldiers then ordered the merchant's son, Aaron, to deliver it to the synagogue, which was a short distance from the store. The soldiers were fully-uniformed and armed. Aaron had no choice but to oblige them. He rolled the barrel down the hill and set it inside. Later that day I walked by the synagogue. It seemed strangely quiet. On this day before a holiday, the synagogue should have been bustling with people, yet no one was around. Even Moshe the caretaker, who could usually be seen in front of the building or in front of his house next door, was not around. Curious, I decided to find out why. The synagogue doors were wide open. A group of Polish people stood on the sidewalk, stretched their necks to look inside. I knew something was wrong. Avoiding the glares of the nearby German soldiers, I snuck inside. I reached the door threshold and froze. There was Aaron, slumped over a table, shot dead. He was 25 years old. A few feet away from him sat the barrel of nafta. For a moment, I could not move. I looked around, nervously, quickly, uncontrollably, felt the awkward emptiness of our synagogue, saw the bimah in the center of the floor, the holy pulpit where our holy scrolls are rolled out, the long benches surrounding it, the benches where so many of us have congregated, where I have seen Aaron's family so many times, where happy people listen to the scriptures, holy people, good people. I looked at the Ark, the beautiful, mystical, holy cabinet that holds the scrolls, a cabinet so still and so useless, so defiled with Aaron's body lying dead. And the curtain that enshrouds it, the holy curtain that shields the scrolls from the unholy world, protects them from the sinners, the evildoers; the thick silk curtain that hides the scrolls, a silly curtain decorated with lions. Lions - a symbol of strength. What strength was here? Whose strength was here? I glanced at Aaron's lifeless body and knew this was it. This was the end. I ran like heck to get out of there and ran to the safe haven of home. At 10 p.m. that night we awoke to furious knocking on the door along with wild screaming. "Let us in, let us in!" Through our double doors, we could not see their faces, but we could tell they were Jewish voices. "Open up, open up!" they yelled. We opened the door. It was our neighbors from down the road, two Jewish families who lived next to the synagogue. "They've lit the synagogue on fire, they've lit the synagogue," they cried. Looking out the window, we saw a huge ball of fire. The synagogue, that beautifully built temple near the river, was burning. Our synagogue, where my great-great-grandfather worshipped, where my family and I worshipped, where we were to have our New Year's services, was up in flames. Its Star of David was crumbling like dirt; the Cheider, our House of Learning, was melting into nothingness. And all we could do was watch. We locked our windows and began to cry. My grandmother panicked. "The ladder, get the ladder," she screamed hysterically. "We have a long wood ladder; we can extinguish the fire." In reality, there was nothing we could do. Even our long wood ladder could not help us now. With this fire, the German troops showed us time was on their side, and for us, it was too late. I tried to calm Grandmother, worried that if the soldiers heard us, they would burn down our house. But it was not an easy thing to do. Bubbeh was in her 80s and wanted only to spend her final years in comfort. Already emotional from seeing her son go to war, she grew even more upset watching the synagogue burn. "We have to stop the fire," she cried. "We must help." A crowd of our non-Jewish neighbors gathered on the street to watch the flames devour our house of worship. "What is going on?" we heard them say to one another. "What happened?" They didn't look happy, but they also didn't look sad. Recalling what was being preached in their churches - how the Jews killed Jesus, I imagined they were standing there laughing to themselves, justifying the fire, thinking that the Jews finally got what they deserved, that the German troops finally did what they've wanted to do for so long. The next morning, we looked out the window and saw the heap of smoldering ashes that was once our synagogue and House of Learning. We heard from others that, in addition to Aaron the delivery boy, Moshe the caretaker was killed. But he did not go down without cause. Moshe was shot by German soldiers when he tried to rescue the sacred Torah scrolls from the burning synagogue. This was our Jewish New Year. Moshe the shammus was mistaken; on this holiday, there would be no services. The shooting of Aaron served as the starting bell for the German soldiers. After that, all hell broke loose. Lawlessness prevailed and we wondered who would be next. Many Polish officials and citizens cooperated with the German troops, became servants to them. Whether intimidated by the strong military presence or simply brainwashed into believing the cause was just, several of our respectable lawmakers and gracious neighbors took sides against us. We no longer knew who to trust. The German troops put the Polish sympathizers right to work. Their first task was to identify Jewish markets. This was not difficult to do - in the small town of Pilzno, everyone knew who the Jewish storeowners were. On Mondays, Polish farmers rode their horse and buggies into town square to sell their crops. Markets and homes surrounded the square, making it a hubbub of activity. My friends and I usually went there after school, to see what was going on and to fool around with the farmers by pretending we were going to steal a piece of fruit. On one particular Monday, things turned ugly. While standing on a corner, we turned to see a group of German soldiers marching into the square. Although they wore the same military uniform we had grown accustomed to, there was a difference. These soldiers had a shiny pin on their collar â€œ SS". The group stopped in the square and waited. A Polish policeman walked up to the group leader, talked to him and then began walking with him. He then held out his arm and began pointing. The Polish officer, who routinely patrolled the square, was identifying to the SS troops the Jewish owned businesses. With their pistols drawn, the SS troops went into the stores. If the owner was not at the counter, they dragged him out from the back portion of the store, the living area. They beat him with their fists and pistols until he fell to the ground. Once he did, they kicked him out to the street. In the center of town square, in front of all the Polish farmers, shoppers and bystanders, the Jewish owners were forced to sweep the dirt. This included the manure left by the horses of the Polish farmers. The job itself wasn't bad; men were paid to sweep the streets every day. But the humiliation was. As the Jewish men swept, the SS soldiers laughed, joked with each other, made fools out of the businessmen we had come to know and respect. The Jewish men tried to stand tall, tried to push the broom with dignity, but those of us watching could see their embarrassment, could feel their ignominy. Those who looked the most religious, the elderly men with long beards, were further degraded. They were tossed back and forth, from the hands of one SS soldier to another. The soldiers raucously laughed at the passive Jews, the Jews who had become their pastime. The Jewish custom of unshaven faces had suddenly turned hazardous. The long beards were an easy target. SS soldiers tugged at the symbol of Judaism until clumps of hair fell to the ground. If the men cried out, they were hit in the face. My friends and I stared with disbelief and fear. On one hand, I wanted to run, but on the other hand, I wanted to witness what was happening in our town. I looked at the people who had gathered to watch - Polish men and women, some with their children. In their faces, I saw amusement. Customers who had shopped at the Jewish stores for years, who had befriended the business owners, were watching the degrading spectacle as if it were entertainment. With elated eyes and intent stares, they saw what the SS troops were capable of. They also learned firsthand how to mishandle a Jew. The cruelty of Hitler's soldiers hit close to home. Whenever I walked through the main square, I stopped at Brust Suit Store, which was owned and operated by my Aunt Cepora and Uncle Josef. Like many merchants, they lived in the back portion of the building. Specializing in men's suit, their store was one of the biggest and most successful in the town. This may be why it was pinpointed. I was in the store after hours, talking to my relatives. Someone began knocking on the locked door, normally at first but then louder. My uncle ran through their home and into the attic. He peeked out the window to see who it was. As feared, SS soldiers stood at the door knocking, pounding, demanding to be let in. My aunt panicked. She put the daily profits into a bag, and stuffed the bag into her shirt. Even though she was a large woman, the bag made her chest look unbelievably big and bulky; it was obvious there was something in there. She took the bag out and handed it to me. "Here, take this in the back," she said. "You're little, they won't hurt you. It's us they're after." I took the bag with me into the rear part of the store, their residential area, and set it down. My cousins, who were in the 20s, rushed past me; they ran out the back door and down the alley. I returned to the front of the store and saw my aunt at the front door, unlocking it. She had no choice. If she didn't open the door, they would have broken it down. The SS soldiers rushed in and pointed their pistols at us. My aunt screeched. One of them smacked her across the face, knocking her to the ground. They saw my uncle leaving out the back door, headed to the alley. They pushed me aside and ran after him, past the racks of men's suits, through my aunt and uncle's house, and out the back door. My uncle realized he had little chance of making it out of the alley. Instead, he picked up a bundle of firewood that was stacked in the alley, held the bundle in his arms and began walking as normally as possible toward the soldiers. He had hoped they would not recognize him, but there was little chance of that - he was the person in the alley. They dragged him back into the door, through his house, through the store. He saw the other SS soldiers in the store, on the street, everywhere. Realizing he would not be able to resist their demands, he picked himself up and walked outside on his own. "Los, los," they again shouted. He must not have been walking fast enough for the soldiers. From behind, they pushed him, kicked him in the back with their black boots, and hurtled him into the square. My uncle joined the other Jews in the square. Some were cleaning the street with a broom, others with their bare hands. No one was just standing there. In order to not be kicked or beaten, you had to do something. He began picking up dirt, sticks. But he was not able to pick up much; he didn't get the chance. The SS soldiers pushed him back and forth, from one pair of brutal hands to the other, laughing, joking to one another. My uncle, the proud owner of Brust Suit Store, was being victimized and all I could do was stand there and watch. Jewish activity in Pilzno was quickly coming to a standstill. Businesses were shut down, either voluntarily or forcibly, and our movements were limited. Those who went out were subject to beatings, beard pulling, and other humiliating abuse. Regardless, some Jews refused to change their ways. The fanatical Jews would not cut their beards. When they went out in public, they tied a large kerchief around their head, tucking their beards into it in the process. This, they assumed, would hold up and hide their long beards. They then capped off the toothache look with their regular top hat. The disguise did not fool the SS troops. Others blindly accepted the abuse. Eliazer Weis was one such person. Respected and revered, he was known as the rabbi who gave advice. After services, when everyone would discuss religion in the House of Learning, Rabbi Weis sat with the wised, most distinguished thinkers. Since retiring from his shoe sales business, he found great pleasure in pondering intellectual matters and often spent his entire day doing so. But something happened to Rabbi Weis after the SS troops occupied Pilzno. Those who went to him for advice often left feeling perplexed and discouraged. "This is God's will," he would tell us. "Everything that is happening now and everything that is going to happen is meant to be." Rabbi Weis told us he was not afraid to die. His lack of fear led him to take chances. Rather than stay inside his home, he routinely walked around town. One morning, he left his home and never returned. Not only were the German troops brutalizing us externally, they were brutalizing us internally. We were hungry. Although we had vast fields outside of our home, we could no longer farm them. We couldn't plant, couldn't plow, couldn't harvest. The fields sat idle. Every now and then we would sneak into the yard to pick some of the crops close to our house. But that wasn't enough. My mother, the provider of the family since my father enlisted, was helpless. Her children were hungry, her mother-in-law was hungry, she was hungry, yet there was nothing she could do about it. We wanted to leave, go where we would be safe, where we would be wanted, but we feared it was too late. Several Jews tried to take the train out of Pilzno by forging identification cards. Since many of them spoke Polish, they pretended they were non-Jews. Many times the German inspectors who took the tickets were fooled, but most times they weren't. When suspicion arose, they would call for backup. German soldiers would board the train, uproot passengers from their seats, and have the men remove their pants. Since every Jew was circumcised, this was an infallible way of identifying those trying to escape. If a Jew was found, he was shot. Our life continued like this for months. Every day, the abuse worsened. It was now 1940 and, as a family, we felt helpless. We had not heard from my father in months and were worried. The SS soldiers routinely drove their trucks down the streets in search of Jews. Those who were picked up were sent to a newly created forced labor camp in the nearby small town of Pustkow. We wondered if they had taken my father. 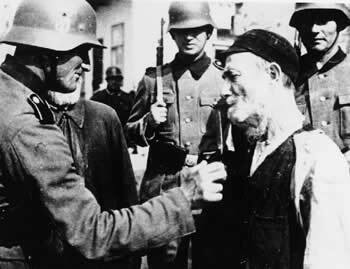 To make identification of Jews easier, the German officials required those 16 and over to wear a white armband with a blue Star of David on it. We were to make them ourselves. My mother tore up old bed linens and made one for herself, Leib and Michael. Leib did not want to wear one. He figured we lived in a small town, no one would notice whether he was wearing one or not. Whenever he went to the store or a friend's house, he left the armband home. He was soon noticed - by a Polish policeman. My oldest brother staggered home bruised and beaten. He went to the couch and stayed there for several days. He could barely walk and he was sore, very sore. My mother was upset; she could see that her son was suffering. But Leib minimized his bruises. He was embarrassed to admit, sickened to think that he no longer had authority over his daily actions. Leib could not nurse his injuries for long. Those capable of working were ordered to assemble at the center of town for registration and photos. Although I was too young to wear an armband, I was not too young to work. My brothers and I lined up in front of one of Pilzno's largest buildings. It was there that we realized there was no one left to trust. We were sent to one of two tables set up in the hallway. Seated at the table to the right were two German officials. At the table to the left were those whose betrayal would hurt the most, three fellow Jews. Just last week they were family friends, members of our Hebrew community, members of our synagogue. Now they were German collaborators. Called Judenrat, which in German means Jewish council, these traitors helped marshal slave labor. To further their crusade, the German officials routinely devised outlets for labor. They then relied on the free manpower of Jews to provide that labor. It was the Judenrat's duty to round up the workers. Each night, a Jewish servant would deliver to select Jewish homes a notice to appear for labor the following day. The Judenrat also maintained a file of every Jew. On a weekly basis, they recorded each Jew's labor instructions as well as whether or not those instructions were followed. If they weren't, the Judenrat would inform the SS troops. The offending Jew was then either killed on the spot or sent to an extermination camp. Most families knew the Judenrat members from the Hebrew community. Some were even able to bribe them. Unfortunately, my mother did not have money to offer; my brothers and I were selected almost daily. Our detail was road word. To ensure that the German military vehicles enjoyed a safe route, we had to repair the roads, clean them, and, in the winter months, remove the snow. We were young: I was 15 years old, Michael was 17 and my oldest brother Leib was 19. We should have been studying, dating, socializing with friends, learning how to become independent. But, for us, being a teenager was no longer an option. Instead of being vital, energetic youth, we were now subservient pawns in the absurd prophesy of Hitler. My mother often pleaded with the Jewish officer, asking him to spare my older brothers so that they can help out at home. The Judenrat would watch her speak but hear nothing. His callousness shocked us. How could one Jew turn so easily against another? By helping the enemy, he was helping us suffer. Rather that unite during its time of need, the Jewish community was tearing itself apart. It pained us to see that Jewish families with money did not have to work, but my brothers and I did. It pained us even more to see the Judenrat dispatching our labor orders. The same people we shared kosher meals with, prayed with, celebrated holidays with, were now letting us bear the burden. We were hungry, too hungry to work, and we were weak. We had no food and we had no strength, yet each morning we had to report for labor. By organizing Jews against us, the German officials succeeded in breaking down our spirit. Through their deception, the Judenrat destroyed the entire meaning of Jewish life, opened it up for public viewing only to stomp on it. In an effort to prove to themselves and to the invading soldiers that they weren't part of the problem, they weren't the chosen ones, they betrayed their people and themselves. To save their skin, they sold their Jewish soul. The unspoken allegiance had been broken; our Jewish community was effectively shattered. We found out that my father was in a German military prison. At first we were able to send him small packages of bread, but later, we were not able to have any contact. This worried my Grandmother; she constantly talked about and prayed for her only son. I tried to comfort her. "Don't worry Bubbeh; the war will be over soon. He will come home soon." I did not know what I was talking about. I knew that my comments were unrealistic, but I said them anyways. I just wanted to make Bubbeh feel better. One chilly spring morning, my mother headed outside to gather wood for the stove. When she opened the front double doors, she heard a faraway shout. She worried that it was a SS guard ordering her back inside. She looked to see a man in the distance, walking toward our house by way of the fields. He called out again. This time, his voice sounded familiar. "Don't worry Rachel, everything will be okay," he cried. It was my father. He was home. The leader of our household, our guiding light, our brave soldier, was home again. But he no longer looked like a brave soldier. His uniform was gone. His fearless countenance was gone. He looked tired, worn. His usual dark hair and reddish beard were now predominately grey and his attitude was bleak. As we fretfully listened, he told us about his experiences. The Polish army had retreated and his battalion was heading east, to the part of Poland that was Russian-occupied. When the Soviets came upon them, they wanted to enlist them, told them to take a train to Russia so they could join the Russian army, expected them to report the next day for a Russian uniform. By this time, my father had seen enough of the military. He was disappointed with the lack of foresight and resources in the Polish army and wanted nothing other than to get back home. Leaving his platoon, he crossed the River San into the German-occupied section of Poland and headed to Pilzno. It didn't take long for him to be noticed. He was sent to the Stalag 17 military prison. Once there, the Jewish prisoners were separated from the non-Jewish prisoners. They were housed in a thin canvas tent during the brutally cold winter and were barely fed enough food to stay alive. Every day, the German prison guards relayed tales of Jews that were tortured or killed. My father said he never thought he would see his home or family again. Even though the guards told the military prisoners they would soon be released, after hearing those stories, they were doubtful. "Ein jude dem anderen wird in gegenseitig bescheissen," he said with a faux German accent. "This is what the guards told us, that the Jews will betray themselves." Two weeks after returning home, my father received a notice from the Judenrat to report for forced labor. He did not go. He had just spent months frozen and starved in the military prison; he knew he could not subject himself to more abuse. Surely there were younger, more capable men they could select for their labor. The Judenrat sent the Polish police to our house. My father, who was sickened at the thought of the German sympathizers, always saw the officers coming. A major part of our day was spent sitting near the window, looking, waiting to see if anyone turned onto our property. When the Polish police headed to our front door, we warned my father. He would run to the back of the house, open the rear window, climb out and run - through the wheat fields, over the potato plants. He would run and run and from inside the house I would watch as his figure disappeared into the distance. My mother would tell the Polish police that he was not home. "Tell him we just want to talk to him," they always said. "Have him report in the morning so we can talk to him." We knew what kind of talk it would be. A few hours later, my father would return. We had no idea where he had been hiding and did not ask. The Polish police kept coming to our house looking for my father, once, sometimes twice a day. "Where is Berel Turk? We just want to talk to him." This worried Grandmother. She was 82 years old and in good health but the police terrified her, weakened her, left her to think only of her son. "We should be thankful to God that he sent your father home," she kept saying. But he was not home; the more the police came looking for him, the more he was forced to hide. Hours turned into days; my father was afraid to come home. I did not know how to react, did not know what to think. In one sense, I was relieved that my father escaped the brutality and proud that he defied the Jewish and Polish betrayers. But in another sense, I was sad that he was not home. Grandmother missed him terribly. He was her only son, her tower of strength since Grandfather passed away, her purpose in life. Tormented by grief, she grew weaker and weaker. The world had become too dangerous, too frightful for Bubbeh. She no longer wanted to live. "I want to see my son again," she would moan again and again. "I wish he would come home." Nights were especially troublesome for Bubbeh. My cats often woke me up, either by meowing too loudly, chasing each other or pouncing on me. Once awake, I could hear her calling out from her room. "I need help, I need help." She would call out again, louder, faster. Still no one responded. Finally, I would get up and go to her bedside. She always had a different reason for calling out - she needed to use the bathroom, needed water, needed a snack, needed someone to help her out of bed, needed someone to help her turn over. But we both knew that what she really needed was someone to cry to. "I wish my son were home," she would say over and over. After helping her, she always blessed me. "God will help you," she said. "You're going to be okay." Grandmother died one night, depleted and heartbroken. Her Jewish world had come to an end. We buried Bubbeh in the Jewish cemetery. Since the SS troops prohibited any Jewish rituals, in order to do so, my oldest brother and two older cousins had to sneak out late at night and carry her body through the wheat fields. Marking her grave with a headstone was out of the question - the German soldiers routinely ordered laborers to smash all the monuments and headstones in the Jewish cemeteries. To mark Bubbeh's grave, we left a small wooden marker. We could not mourn long for Grandmother; we had other adversities to content with. The Judenrat persisted on coming to our house looking for my father. When they saw that he was not there, they grabbed my brothers instead, turned them over to the Polish police. My brothers were beaten and held in a makeshift prison. Hearing this, my father decided to give himself up. He could not hide out and allow his sons to take the abuse intended for him. He reported to the officials and said he was ready to work. They sent him to Pustkow, the labor camp. There they tortured him and beat him. He died in 1942 from severe injuries. Instead of a cemetery burial, they threw his body in an open field. This time, our father was really gone. No matter how many times we stared out the rear window, no matter how many times we looked out the front door, we would no longer see him running through the fields, running toward his family, running to his home. With both Grandmother and Father gone, our family had dwindled to just my mother, two sisters, two brothers and me. Despite my father's death, we had no time to grieve. My brothers and I were expected to work, to provide free labor to those who had killed my father, those who had frightened to death my grandmother, those who were juggling my family's lives in their impulsive, deranged hands. The situation was especially difficult for my oldest brother. Although he was two years older than Michael, he was not as tall as him and not as muscular. He was the delicate one, the blond-haired, lighter-skinned one. Mentally and physically he could not endure the daily strains of forced labor. His body gave up. During an inspection, Leib was found to have typhus. He was sent to Pustkow, the same extermination camp were my father was beaten to death. We never saw him again. He was 20 years old. Michael and I were sent to a nearby quarry to crush large stones. As I hit each rock, I fantasized that things were not as bad as they seemed. After all, we were working. Work is not harmful. Michael and I were young; we could survive. Over and over in my head, I repeated a line from our morning prayer: "Ane maamen," which means I believe. I held onto my prayers and I held onto my dreams, hoping things would get better. Instead, they got much worse. The German officials ordered us to evacuate our house and relocate to a small, filthy part of town. This was not an easy thing to do. We were being forced to leave the one thing that provided safety for us, the one place where we were still a family regardless of what was happening outside. Our orders were to leave and we were only given an hour in which to do so. Our Polish neighbors stood at a distance, watching. We were the only Jewish family in the vicinity; they now would be able to witness the brutality they had been hearing so much about. For them, our nightmare became a spectacle, an event. Their reason for ogling us served another purpose. They knew that once we left they could go into our home and take whatever they needed. This we could not worry about. What did it matter? What good were possessions when we were fighting for our lives? We were only permitted to bring with us a little extra clothing anyways. If they could use what we had, so be it. Better them than the German troops. One hour to leave. From the road, German and Ukraine guards were watching us, waiting for us. We gathered some essentials Ã¢â‚¬â€œ clothes, blankets, and went outside to meet them. It felt as if we were stepping into hell. It was frightening and it was wrong. I turned around to look once last time at our home. There it was - my ancestor's home since the 1700s, the place where I was born, the place of so many family gatherings. It had always been my destination - after winter sledding, after playing in the forest, after walking home from Cheider by myself. It was the place where I helped Bubbeh late at night, and it was the place where I watched my mother bake so early in the morning. My mother. I looked at her now, frantically leading her children to an unknown destiny. She pulled at my little sister, who did not want to leave. Ester was young, not even in grade school. The thought of leaving her home, her bed, our cats, her cloth dolls, was more than she could bear. She was terrified of leaving, terrified at the site of my mother's worried face, terrified at the soldiers who waited for us with their guns. I looked back again at our house, saw the fields that my father plowed so diligently, saw the crops that we were not allowed to harvest, the crops that our Polish neighbors would soon get to enjoy. Our home on the hill. What did it matter now? We met the guards and began walking, past our fields, past our apple tree. I couldn't resist looking back one last time. Our Polish neighbors were gathering at our front door. We were taken a rundown section of the old marketplace. It was the dirtiest corner of town. Hundreds of other Jews already were there; it seemed the entire Hebrew population of Pilzno had been crammed into this approximately 100 sq. ft. area. There were no fences, but none were needed. We were held in by terror. German guards surrounded, watched our every move. Their Jewish helpers, the Judenrat, assigned each person or family living quarters, structures that were once used by farmers to prepare their harvest for market. This was where farmers would thresh the straw, where they would beat it with a stick in order to get the grain out. This was where we would live. Those who had money for bribes were assigned a larger space. We were not one of them. My mother was given a 6 x 8 ft. shack. A former storage area for coal, it was not only small, it was dirty. The ashy residue made it so that we could barely breathe. Space-wise, there was only enough room for each of us to kneel or sit. But she did not complain. What could she do? We no longer had my father to fend for us; we were on our own. Pieces of straw were scattered outside. My mother and sisters gathered some to use as their mattress. I could not bear to ask for any so I slept on the cold ground. It really didn't matter what I was sitting on. I was exhausted - mentally, physically and spiritually. I found a spot on the floor, sat down and tried to sleep. This was not easy. Hunger pangs stabbed at my stomach, kept me awake. I was starved, famished. I thought of coyotes and realized that, at that point, they probably had better thoughts than I did. I tried to ignore the hunger, told myself over and over that I was lucky to still be breathing. A deathly silence hovered above the dilapidated marketplace. Crammed inside each building were hundreds of people, Jews who once laughed loudly, who once talked confidently, but now, no sounds were heard. In our small storage area, no one spoke. What was there to say? We all were so full of anguish, we couldn't talk. We saw what was going on, we knew what was happening. I looked at my mother, the woman who for years brought me safety and comfort, and saw that she was deteriorating. From her slow, heavy motions, I saw that she was in pain - excruciating, bleeding, life-sucking pain. From her empty _expression, I knew she was helpless, barely existing. Like the dirt on the floor, she was just there. Still I felt good being near her. They may have taken my father, my brother, my home and my belongings, but at least I still had my mother. During the day, my brother Michael and I continued to work in the quarry for the German firm Bergauer and Kassaker. A truck picked us up each morning at 6 a.m., drove us 10 miles to the construction site then brought us back to our shelter after 5 p.m. Other than the fact that we had armed German guards watching our every move, it seemed like a regular job. We were happy for the daily routine; it brought structure into our displaced lives. By working hard and complying with the guards' demands, we hoped to save what was left of our family. The labor was strenuous and the conditions harsh but knowing we were on the same jobsite helped ease our load. When I wasn't crushing stones, I was spreading gravel with a push broom. Unfortunately, we did not have appropriate clothing for this type of work. Hot asphalt frequently spilled onto my clothes, burning my skin. I complained about it once, and only once. The worksite supervisors, employees of Bergauer and Kassaker, often beat the laborers for no apparent reason. After complaining one day about the splattering asphalt, a supervisor began beating me. I cried. Not only did his fists hurt, my body and mind could take no more pain. Because I was crying, he beat me again, harder, faster. I stopped crying and let him continue beating, but this time without the gratification of seeing his victim crumble. I numbed myself to his cruelty and allowed his hits to hurt me no more. He hit me again and again. I endured his anger until he tired of the sport. When he was finished, I pulled myself up, brushed off the bruises, ignored the pain, and went back to work. I had no choice; that was the only thing I could do. Unless you were dead, you were expected to work. If you did not work, if you could not pick yourself up from a beating, if you could not shake off your bruises, you were shot dead and thrown into the ditch. Since that day, I learned to ignore the stings of hot asphalt and keep working. Despite undergoing hard labor for long hours, we were not given any food. The paid non-Jewish employees who were working on the site and the German supervisors took a lunch break each day. They sat together and gleefully ate their sandwiches and salads. We continued working. Back at our coal shelter, my mother spent her days trying to find food - a piece of bread, crumbs, anything to sustain her daughters and to keep Michael and I from collapsing. Usually she was unsuccessful. After about two weeks, we heard rumors that the German officials ordered 60 horse and wagon sets from the Polish farmers. We knew that these were often used to transport Jews to death camps. By using uncovered wagons, the German troops deepened the humiliation; helpless passengers were put on display for all to see. We feared and anticipated that the wagons were for us but we held onto the belief that they weren't. A few days later, as we were being taken to our jobsite, Michael and I saw the wagons in the center of town. Still, we convinced ourselves that they were not for us. We went to work just like any other day, crushing stones, spreading asphalt, and dreaming of our former life. When the truck dropped us off later that day, the part of town that had become our home looked empty. A lone guard stood at the entrance. We walked toward the buildings. Strewn about the ground like filthy garbage were articles of clothing and personal belongings. The final remnants of people's lives, the items they considered valuable enough to take when they were evacuated from their homes, were lying worthlessly on the ground. And their owners were nowhere to be seen. The eerie silence hurt my soul. My body felt weighted and I wanted to cry. I ran to my family's section, praying that they would still be there. It was empty. I ran through the scattered clothes, searching for something that belonged to my mother or sisters. The few German and Ukraine guards that remained at the deserted marketplace were following me, watching me, but I did not care. I ran in circles, looking, looking. I found nothing. Maybe they did not board the wagons; maybe they were still here, hiding somewhere. I ran again through the trail of belongings and nearly trampled on two torahs, our sacred scriptures. I looked down at them and recognized them. They were the personal scrolls of Rabbi Horowitz. I looked down again. There it was, something I recognized - my sister Ester's dress, my baby sister's dress. I picked it up from the dirty ground and felt the soft fabric. Numbness clogged my veins, froze my being. The guards told us to stand in front of the marketplace, at the street. A truck picked us up and took us to the others. They had been taken to the nearby city of Debica. When we arrived later that evening, we saw thousands of Jews lying in a big field in front of the railroad station. They were not only from Pilzno but from every neighboring town. German and Ukraine guards surrounded them and shot anyone who chose to stand. We were ordered to go in and lie down, but I had other plans. "I have to find my mother; I have to find my mother." I stooped and I crawled and I moved through the masses, searching for my mother and sisters, thankful that there was a good chance they were still alive. For once in his life, Michael was following me; he moved right behind me. We frantically groveled through the lifeless bodies, searched the empty faces, asked if anyone had seen our mother, Rachel Turk, or our sisters, Sarel, with the dark hair, and Ester, with the light red hair. We searched and we asked and we searched some more. There were so many people, too many bodies. It was dark and I could not see. The German and Ukraine guards were everywhere so I could not shout, could not call out for my mother and sisters. We crawled through a group from a nearby small town. They were lying together; everyone from the town was in the same general area. In this chaotic blanket of bodies, there was a semblance of order - the people had grouped themselves according to their community. They directed us to the Pilzno section. We pushed ourselves over and found families we knew. They pointed to my mother and sisters. I immediately dropped down next to them. My mother told us what happened. While Michael and I were at work that day, the German and Ukraine soldiers dragged and loaded about 3,000 Jews onto the 60 ordered wagons, all within a four hour time period. As the Jews were paraded through town, my mother observed Polish children gathering on the streets to watch. Their older counterparts observed from a distance. The Jewish wagons garnered as much attention and enthusiasm as a traveling circus. Along the way, the wagons stopped. About 500 elderly men and women were told to get off. If they moved too slowly, they were dragged off. Also ordered off were those who looked the most devout, specifically, the long bearded men. Included in this group was our beloved Rabbi Horowitz. They were taken to the nearby forest and forced to dig a large pit in the ground. The Jews remaining on the wagon, including my mother and sisters, heard the shots. Some saw the bodies fall into the pit. The German and Ukraine soldiers returned without the elderly and devout Jews. Missing from the wagons were the Judenrat, the Jewish traitors who helped eradicate the Jews from Pilzno. Once the old marketplace was liquidated, there was no longer a need for them. Rather than go to Debica with the others, with their fellow Jews, they went into hiding. As usual, their main concern was self-survival. Despite the weightiness of what she was saying, my mother's words flowed into my ears, soothed my tattered soul. I had crawled through thousands of bodies to find her, had feared she was gone forever, and now here I was, lying right beside her. No longer did I feel human; I was a small, helpless creature who instinctively found its mother. I laid there exhausted, nearly unconscious, and somehow managed to fall asleep. The guards woke us early the next morning; all workers were to report for ID cards. I lined up behind Michael. We were led to German officials who were seated at a long table near the train station. On the track behind them was a train. We stood in line and waited silently, submissively, on that hot July day. When it was Michael's turn to face the officials, he told them his name. They found his card, verified that the photo was his then threw the card at him. They did the same for me. The ID card was our license to live. The German military and several private firms were eager to take advantage of our free labor. Our inhumane treatment became a business venture, an economic remedy in the troubled times. We were in high demand and our ID card was our proof of that. Or so we thought. Clutching their cards, the workers were led inside a building. German officials again verified that the cards belonged to the holder then collected them. We were told to wait outside. We waited and we wondered. The longer we waited, the more nervous we grew. Without our card, we may as well have been stripped naked. Without the assurance of being one of the workers, of reporting to work day after day, we would be exposed to the same uncertain fate as the Jews on the field behind us. By working, by having a card, Michael and I were of value. We were not useless, pitiful Jews whose lives could be taken without regret. We were important and our family - our mother and sisters - was also important. After what seemed too long a time and too short of one, the German officials stood on the steps of the building and began calling out names. If your name was called, they stamped your card and again threw it to you. Once more we were left to wait, to wonder. We stood there in the heat - thirsty, tired, hungry - listening to the names called. Finally they called Michael's name and then mine. We quickly picked our cards up from the ground, relieved that we would be allowed to work each day as usual. When about half of the names were called, the officials decided to stop. Their work crews had been selected. They ripped up the rest of the cards, thousands of them, and told everyone to go back to the field. With our stamped cards in hand, we proudly returned to my mother and sisters. Our forced labor would now pay off; the German guards would surely see that this Jewish family was worth saving. After a few more hours in the hot July sun, the guards ordered those with cards to go to the right, to the nearby barracks. Assuming they meant the worker's family too, we all started walking to the barracks. Other families did the same. The German guards began shouting angrily and furiously. Forcing their way through the drove of Jews, they began tearing people apart, pushing them, beating them, whipping them, striking their heads until blood sprayed out, battering them until they dropped to their death, shooting them. As was so often the case, we had to learn by example what the guards wanted. The workers with stamped cards were being pushed to the right. The rest of the people - the elderly, the females and the children - were being pushed to the left. Those who did not go quickly enough were beaten and killed. Victims fell to the ground like empty boxes. Separate. They were telling us that we must separate. The only ones that were to go to the barracks were the workers. No mother, no sisters, no others. I felt cheated. Despite our stamped ID cards, we would not be able to help our family. Michael and I - who have reported each morning for labor, who have exerted ourselves despite being hungry and tired, who have silenced our complaints and followed the barbaric commands - Michael and I were now being ordered to leave our family, to leave our mother and sisters. Like always, the SS soldiers left us no choice. Anyone who refused their absurd order would suffer the same fate as those we saw beaten to death, those we saw shot down right before their families. I could not bear the thought, could not survive any longer if I saw my little sisters or my mother beaten like that. To protect them, Michael and I went to the barracks while they went back to the field. We separated from them because we had to. We had no choice. When we walked into the barrack, I pushed myself to a corner of the room, dropped to the floor and cried. Loudly. Uncontrollably. Painfully. My tears, my pain kept coming. I could not stop. Outside the SS soldiers were running back and forth, shouting their commands, pushing, shoving, ordering those on the field into the boxcars of the train. Shots were fired. I thought of my relatives, my mother, my sisters. Somewhere in that crowd, the crowd that was being pushed like cattle, herded like useless animals, somewhere in that crowd of beautiful Jews were my relatives from Pilzno, at least 45 of them. Somewhere in that crowd were my sisters, my innocent little sisters, and somewhere in that crowd was my mother, my dear sweet beautiful mother. My screams, my cries, my pain continued for hours. The voice of my suffering saw no end. The others in the barrack begged me to stop. The SS troops were patrolling back and forth, beating people for the slightest reason. They feared the soldiers would hear me, would come in and kill me, would kill them as well. I stopped crying but not for my own sake. I did not care about myself, did not care if the SS soldiers came in and shot me, if they ended the breath of what already was dead. But I cared about the others. It they wanted to live, I would not get in their way. From the barrack we saw them load about 150 people onto each boxcar - men, women, children. From the barrack, we heard their shouts, their orders to move quickly. We heard them close the boxcar door and we heard them push the loaded train onto a side track. We listened for the sound of a train engine but heard nothing. The train was going nowhere. In the sweltering July heat, the overcrowded train would sit on the track. The thought of our beloved family members fending for space, fending for air, fending for their lives, horrified us. The next morning when we reported for labor, we saw that the train was gone. Sometime during the night, my mother, my sisters, my relatives were taken. I felt empty, like nothing. I had no feeling except pain. I was no longer a person, I was simply pain. My world had ended. As usual, I went to work that day, my corpse, my empty being went to work that day. I was grieving but could not cry. If I made sounds or motions, the German guards would shoot me. At first thought, I didn't care whether I lived or died. But then I looked around, looked at those working beside me. Everyone was in the same situation; we all were suffering the pain of families lost, of loved ones tortured and killed. I saw a Jew who, like me, was young and small. He was still breathing, still moving; he continued living. If he could carry on, so could I. Like my fellow workers, I learned to bury my tears in the slave labor. Because the work was hard and gruesome - torture most of the time, it overshadowed our inner grief. But it did not make it disappear. While we blindly followed orders, we got lost in our own private agony. No one said a word; we were not allowed to. But whenever we wanted to give up, when the pain was unbearable, we would look at each other. We knew we were all suffering, yet we saw that we were all still working, still moving, still breathing. By seeing each other endure the unfathomable, we gave each other strength.